Composite pressure vessels have been finding wider use in the aerospace industry with applications such as solid rocket motor casings and fuel or oxidizer tanks for liquid rocket motors. Several nondestructive evaluation (NDE) techniques have been developed that are highly capable of detecting damage in the outer composite structure. Among these are thermography, shearography, and ultrasonics. These imaging methods detect flaws, such as manufactured disbonds or inclusions and impact-induced delamination, by indicating the flaws' effect upon the field properties of the structural material. Thermography indicates a flaw as an anomaly in the surface temperature field values during an imposed heat flux. Many flaws manifest themselves as regions in which conductive heat transfer is retarded or, less commonly, facilitated. This variation in the field thermal properties of the material results in a variation in the surface temperature profile during heat flux. Similarly, shearography indicates a flaw as an anomaly in the surface deformation field values during an imposed state of stress. Many flaws manifest themselves as regions in which the material stiffness is reduced or, less commonly, enhanced. This variation in the field mechanical properties of the material results in a variation in the surface deformation profile during a state of stress. Since both techniques record surface effects of subsurface phenomena, detectability is generally reduced as flaw depth increases. Also, since both techniques are sensitive to variations in material properties, detectability may be reduced along and beneath laminar boundaries between dissimilar materials within a structure. The net result is that a structure which is thick or composed of dissimilar laminae may require inspection of both surfaces. This is the case with a stiff, thermally conductive filament-wound pressure vessel having a rubbery, thermally insulative solid fuel core or liner. External inspection is often incapable of detecting flaws that are deep in the outer casing or along the bond line with the inner core or liner. The apparatus utilized in these types of inspections are essentially specialized illumination and imaging systems. It is often difficult or impossible to insert the optical head or camera into the pressure vessel for inspection of the bond line integrity between the core or liner and the outer casing. In some cases, personnel may be required to crawl inside the structure, which presents several safety risks. The need was thus identified for an endoscopic inspection system. The System Management and Production Laboratory at the University of Alabama in Huntsville (UAH) Research Institute was tasked by the NDE and Tribology Branch (EH13) at NASA's Marshall Space Flight Center (MSFC) to conduct research in development of prototype methods for endoscopic inspection of coatings, bonds, or laminates inside rocket fuel or oxidizer tanks, fuel lines, and other closed structures. The electronic shearography (ES) method images a coherently illuminated object through an image shearing lens to produce an interference fringe pattern. The boundaries between light and dark fringes represent contours of change in surface slope due to some form of excitation. The Pratt & Whitney Electronic Holography/Shearography Inspection System (EH/SIS) at the MSFC NDE Branch's Electronic Shearography Laboratory was modified for this study. This device utilizes a modified Michelson interferometer as an image shearing device, as shown in figure 1. A frequency-doubled Nd:YAG pumped diode laser ( = 532 nm) is used as a source of coherent illumination, the beam of which passes through a beam expanding lens pair and a beam steering wedge to produce a laser speckle pattern on the surface of the test article. The light reflected from the object is collected by a telephoto lens, which provides a variable field of view, and imaged onto the sensor array of a charge coupled device (CCD) camera through the shearing interferometer. Each ray passed through the telephoto lens is separated by the beam splitter into a reference beam and a sheared beam. The reference beam passes straight through the beam splitter, reflects from a phase stepping mirror back along its previous path, and is reflected from the back of the beam splitter toward the camera sensor array. Similarly, the sheared beam is reflected from the front of the beam splitter toward the tilted image shearing mirror, reflected back again at the tilted angle, and then passed through the beam splitter toward the sensor array. The sheared beam is incident on the sensor array at a point that is shifted, or sheared, from the reference beam although both beams originated at the same point on the test article surface. Each point on the surface of the object is thus imaged to two separate pixels on the camera sensor array. A more complicated reverse ray trace shows that, similarly, a single pixel on the camera sensor array images two sheared points on the surface of the object. Assuming a planar object, all points in the image are sheared by the same lateral distance, referred to as the image shearing distance, s. The sensitivity of the device is proportional to s and thus related to the angle at which the image shearing mirror is tilted. By varying the tilt angle and direction of the image shearing mirror, the operator may adjust the sensitivity of the device to suit the structure being evaluated and the type of excitation being applied. In the static test mode, sheared images are digitally acquired before and after some form of excitation is applied to the test article. The intensity recorded on each pixel is a function of the relative phase, or object to camera distance, between the light rays reflected from the two corresponding points separated by s in the direction of image shearing on the object surface. The pixel intensity is thus a function of the relative slope across that interval of the image shearing distance. After the test object has been statically excited, typically by heating, cooling, or changing the pressure to which it is exposed, then a second sheared image is recorded. The digital frame subtraction of these two images results in a shearogram featuring a fringe pattern indicative of full-field values for the change in surface slope at each point on the object surface due to the excitation load. Unlike electronic holography (EH), which produces fringe patterns indicative of object displacements toward the camera, ES senses changes in the slope of the surface of the object along intervals of the image shearing distance. That is, the fringes are produced by differences in motion toward (or away from) the camera between points separated by s. In addition, some EH techniques pass the reference beam directly from the laser to the sensor array inside an optical fiber, and only the object beam reflects from the test article. Other EH techniques illuminate the test object with two coherent beams having almost entirely different optical paths in object space. The optical paths of the reference and sheared beam in ES differ only inside the interferometer. The ES technique is thus less disturbed by environmental effects (changes in vibration, temperature, etc.) than is EH. The ES apparatus does not require extensive environmental isolation, such as an optical air table, and is regularly used for field evaluations. Thermography utilizes an infrared camera to image the region being inspected. It can be shown that if the camera is imaging a test article, the intensity of the infrared light striking the sensor is related to the temperature of the test article surface by the emissivity. The voltage output from the infrared sensor is proportional to the intensity of infrared light that strikes the sensor. Thermography thus provides a noncontact method of surface temperature measurement. Older raster scan thermography cameras utilized a single sensor element and a pair of rotating prisms to scan the image across the sensor element. Later line scan systems integrated a linear arrangement of multiple sensor elements that reduced the required scanning to a single direction and increased frame rates. The newest thermography cameras utilize a focal plane array (FPA) of sensor elements that eliminates the need for scanning, allowing even faster frame rates. All of these technologies, raster scan, line scan, and FPA, provide full field noncontact surface temperature measurements in real time. The surface temperature of a solid body exposed to heat flux is determined by the amount of heat flux and the material properties of the body. The presence of a flaw in the body being imaged and exposed to surface heating will alter the conductive heat transfer properties in the region of the flaw. The surface temperature over the flaw will deviate from that over a region containing no flaws. By imaging the surface temperature field values during or soon after a spatially uniform thermal excitation, flaws may be detected as anomalies in the observed pattern. Thus, thermography provides a full-field, non-contact, real-time method of subsurface flaw detection. A design was developed and tested for an endoscopic shearography method. This design is a prototype that suggests the feasibility of a commercial apparatus and the supporting methodology. The original concept of the endoscopic inspection apparatus was to replace the telephoto zoom lens of the shearography camera with a commercially available borescope, as illustrated in figure 2. The shearography camera could then be positioned outside the test article with the objective end of the borescope inserted through the end boss of the pressure vessel for internal inspection, as shown in figure 3. (Note that for purposes of illustration, the image processing hardware between the optical head and the monitor is not shown in these figures.) Either the camera, the borescope, or the test article could be rotated between inspections to provide full radial or azimuth flaw detection. The camera and borescope or the test article could be translated between inspections to provide full axial detection. If the borescope was equipped with a tilting objective, full inspection of hemispherical dome ends would be possible. The performance of the borescope as integrated into a shearography system is limited by how clearly and coherently the borescope transmits the laser illumination and object image. a. Coherence and Source Approximation. The laser beam that leaves the borescope and illuminates the object surface should approximate a single coherent source. Interference between multiple coherent sources or lack of coherence will prevent proper interferometry. b. Expansion and Intensity. The illumination beam should expand from the borescope to illuminate the test article within the appropriate imaging field of view with sufficiently bright and uniform intensity that the entire field of view may be recorded by the shearography camera. a. Coherence. The image of the illuminated test article that enters the borescope objective and exits the eyepiece must maintain sufficient coherence to allow proper interferometry. The coherence and aberration requirements for acceptable illumination and imaging performance necessitate that flexural bending of the borescope be minimized with respect to static self-weight loading and environmentally induced vibration. Bending of the borescope may deteriorate the coherence of any beam passing through a fiber optic bundle, as each fiber will be exposed to a different stress state resulting in an exiting beam with different phases. Bending of the borescope may also introduce aberrations as the relay lenses in the imaging path will not be stressed uniformly. The use of a commercially available borescope with an existing shearography camera that was designed to use a telephoto lens imposes the constraint that the borescope must be adapted to optically and mechanically "fit" the shearography camera. a. Illumination Beam. The illumination beam of the shearography device must be steered such that it illuminates the interior of the test article and satisfies performance requirements. The illumination path required is perpendicular to that for conventional telephoto shearography. b. Imaging Beam.The imaging beam exiting the borescope eyepiece must be directed into the interferometer of the shearography camera. The focal point of the imaging beam exiting the borescope eyepiece must be placed sufficiently close to that of the conventional telephoto lens, which is replaced by the borescope, such that acceptable interferometry may be performed. The borescope must be mounted to the front of the shearography camera in such a way that proper optical coupling is achieved. The borescope must be supported such that performance requirements for minimization of bending and vibration are met and motion of the borescope relative to the interferometer is eliminated. The telephoto zoom lens of the Pratt & Whitney Electronic Holography/ Shearography System is replaced by a commercially available Olympus Series 5 R060-047-090-50 side viewing rigid borescope (diameter = 6 mm (0.24 inch), working length = 47 cm (18.5 inches), field of view = 50°) with a C-mount adapter provided by the borescope manufacturer, as shown in figure 2. This borescope uses relay lenses and a mirror to image the test article from the objective lens on the borescope tip to the viewing lens in the eyepiece. An integrated fiber optic bundle provides an illumination path with light entering through the pistol grip handle and exiting adjacent to the objective lens on the borescope tip. The mounting adapter screws into the C-mount conventionally holding the telephoto lens and attaches around the 9 borescope eyepiece with a collet. This attachment provides mechanical stability between the adapter and interferometer and also provides optical coupling of the imaging beam. A gel light guide is used to couple the unexpanded shearography laser beam to the fiber optic bundle light guide that is integrated internal to the borescope. The apparatus of the preliminary design was constructed and a flat test panel containing programmed defects was placed in the field of view. For purposes of validation, the flat panel is an acceptable substitute for the type of enclosed structure this design is intended to inspect. However, it was found that the illumination of the part lacked sufficient intensity for imaging. With all ambient lighting turned off, only a faint green glow was visible on the test article surface. 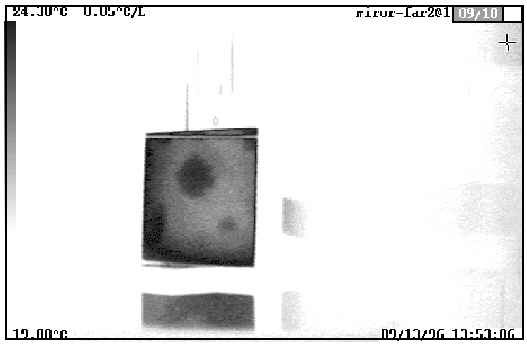 The laser light on the test article surface also lacked the "speckled" appearance of conventional shearography illumination. The lack of intensity of the laser illumination provided by the preliminary design was believed to be caused by several loss sources inherent to that design. At the point where the unexpanded laser beam enters the gel light guide, some of the beam is reflected and does not enter the light guide. The liquid gel medium of the light guide probably further attenuates the laser beam. At the borescope end of the light guide some of the laser light is internally reflected due to the air interface. More of the laser light is reflected at the entrance to the borescope's fiber optic bundle illumination path. These intensity losses could perhaps be overcome by a more powerful laser or by simplifying the illumination optical path. The lack of "speckled" appearance in the illumination at the test article surface indicates a more serious shortcoming of the preliminary design. 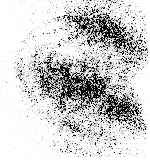 The speckle pattern in conventional shearography illumination is due to interference on the object surface. Surface roughness on the order of magnitude of the illumination wavelength causes the incident light to be reflected at a slightly altered angle and with a slightly altered phase at each point on the object surface. Interference between different reflected rays causes the familiar laser speckle pattern and its absence indicates that the illumination beam lacks coherence at the test article surface. Since the beam has become incoherent before it even enters the imaging optics, there is no possibility of interferometry. The lack of coherence is suspected to be due to the multiple optical paths through the fiber optic bundle inside the borescope, resulting in multiple sources of illumination, and degrading the beam coherence. Since the fiber optic bundle was designed for incoherent white light illumination it is likely that the fiber lengths vary by considerable amounts relative to the laser wavelength, which results in further beam degradation. As a result of the preliminary design review it was concluded that the illumination optical path must be modified to increase intensity and maintain coherence. One possible solution proposed at this time was to shorten the illumination optical path by removing the gel light guide and steering the unexpanded laser beam directly into the borescope fiber optic bundle illumination path at the connection port in the borescope handle. Another proposed solution was to utilize an alternative illumination path external to the borescope. The first design revision attempted was to remove the gel light guide from the illumination optical path and steer the unexpanded laser beam directly into the borescope optical fiber bundle illumination path. This modification introduced considerable alignment complications but did not appreciably increase the illumination intensity. It was thus determined that an illumination path alternative to the borescope optical fiber bundle would be required. Next, a single optical fiber was positioned along the exterior of the borescope such that the unexpanded laser beam would enter one end near the borescope handle and exit the other end near the borescope objective. The exit end of the optical fiber was oriented perpendicular to the borescope such that it would illuminate the objective field of view. However, the illumination provided by this single optical fiber was even less intense than that previously achieved. With all ambient lighting turned off, the beam expanding from the optical fiber tip was barely visible on a sheet of paper for distances less than an inch. This design could be improved by utilizing a precision fiber optic positioning mechanism. Such a device was not readily available to the investigators at the time of this study and the crude positioning mechanisms fabricated from C-clamps and wooden blocks were inadequate. Proper positioning of the entrance tip of the optical fiber would increase the illumination intensity and should be investigated further when the necessary apparatus becomes available. The difficulties encountered in attempting to utilize gel or optical fiber bundle light guides as illumination paths arise from the fact that they are intended for use with incoherent white light. They are designed for maximum transmission where interference phenomenon may be neglected. That is, the white light guides transmit the light from the source but do not attempt to image the source. An alternative illumination path that would image the unexpanded laser beam to the objective end of the borescope and then expand it would approximate the required coherent point source. This is the inverse of the optical function of the relay lens system used for objective imaging in the borescope. It was proposed that if the borescope relay lens system were capable of imaging a coherently illuminated part from the objective to the eyepiece, then perhaps this system would image the coherent unexpanded laser beam from the eyepiece to the objective. A pair of borescopes, one for illumination and one for imaging, could be positioned parallel to each other for endoscopic shearography. As shown in figure 4, the original borescope was connected to the shearography interferometer, which had been removed from the EH/SIS shearography head for easier access, with the C-mount adapter. This borescope will hereafter be referred to as the imaging borescope. A second side-viewing rigid borescope, manufactured by Eder Helio (diameter = 11 mm (0.42 inch), working length = 18 cm (7.1 inches)) was obtained and positioned parallel to the imaging borescope with the unexpanded laser beam entering the eyepiece. This borescope will hereafter be referred to as the illumination borescope. The beam expansion lens pair from the EH/SIS shearography head was positioned in front of the illumination borescope objective lens and adjusted such that the exiting laser beam was expanded to fill the imaging borescope field of view at a distance of 30 to 45 cm (12 to 18 inches). The illumination possessed the expected "speckled" appearance and was sufficiently intense for imaging with a CCD camera. An experiment was conducted in which the revised endoscopic shearography design was positioned to image a flat test panel containing a programmed defect. This specimen was fabricated from graphite-epoxy with TeflonTM inserts of various sizes at various depths. For demonstration purposes, a 4.45-cm (1.75-inch) flaw was centered in the field of view at a distance of 30 cm (12 inches) from the imaging borescope. The image shearing distance was adjusted to 3 mm (1/8 inch). The specimen was heated by a pair of 500-W quartz-halogen shop lamps from a distance of 20 cm (8 inches) for 5 minutes. Shearograms were recorded as the test article cooled after the lamps were turned off and moved away from the test setup. 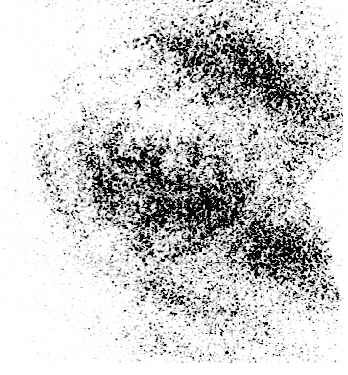 The flaw was successfully detected, as indicated by the circular fringe pattern in the shearogram of figure 5. This process was repeated several times with similar results. It has been satisfactorily shown that the endoscopic shearography prototype design utilizing a pair of borescopes for illuminating and imaging fulfills the performance specifications and overcomes the design constraints outlined in this report. The capability of this design to detect flaws in laminar composite structures has been demonstrated. The prototype was intended to explore the feasibility of such a design, and it does not yet meet all of the requirements of a practical commercial apparatus. The system is not currently portable nor is it particularly sturdy. The apparatus is arranged on an optical table to which it is not fastened. The arrangement and choice of components in the EH/SIS interferometer prevents the laser and illumination borescope from being positioned as close to the imaging borescope as would be optimal. The design could also be improved by incorporation of a beam expansion lens pair that is designed specifically for use with the illumination borescope objective lens, designed for mounting on the end of the borescope, and which incorporates a micrometer adjustment of lens spacing. A spatial filter may be a suitable alternative and may more accurately approximate the desired point source. To provide proper stiffening of the illumination borescope with the attached beam expansion optics and to protect the borescope pair, a supporting structure could be incorporated between or around the borescope pair. A final unresolved issue is that of excitation. The type of excitation to be used for a particular inspection is dependent upon the structure of the test article. A supporting structure for the borescope pair could also support an integrated heat source, such as a lamp, for thermal excitation. This may be a preferred means of excitation if a variety of low production items is to be inspected. However, if the system is to be utilized for routine inspection of a large number of similar structures, it may be advantageous to incorporate the borescope pair into an end cap or other such pass-through that would seal the structure. A vacuum and/or pressurization feed could also be built into the end cap allowing the test article to be inspected with positive or negative internal pressure differentials. Since the prototype is not slated for regular use, the excitation hardware was not fully developed. The final design of the prototype endoscopic shearography apparatus is shown in figure 6. The unexpanded laser beam enters the eyepiece of the illumination borescope, passes through a series of relay lenses, and is imaged to the borescope objective. The unexpanded laser beam exits the borescope objective and passes through a lens pair which causes the beam to diverge. The distance between the lens pair elements may be adjusted to increase or decrease the beam divergence to fit the appropriate field of view. The expanding beam illuminates the surface of the test article and is then collected by the objective lens of the imaging borescope. The coherent image passes through a series of relay lenses and is imaged to the borescope eyepiece. The C-mount adapter relays this image to the interferometer for image processing. Operation of the shearography image processor and other methodology is essentially unchanged. Only minor variations from traditional procedures are required to implement the endoscopic shearography apparatus. The generalized procedure for endoscopic shearography with the borescope pair design follows. Power up the shearography image processing hardware. Ensure that the illumination laser aperture is closed. Power up the illumination laser and allow it to warm up (20 to 40 minutes). Adjust the beam expansion optics spacing such that the desired field of view is illuminated at the appropriate object distance. Carefully insert the borescope pair into the structure to be inspected, noting the length of the borescope pair inside the structure and the viewing orientation. Position the borescope pair the desired distance from the inner surface of the test article. For example, if a cylindrical structure is to be inspected, the borescope pair may be positioned along the axis of the structure. Ensure that no one has a direct line of sight into the structure cavity as it will be illuminated by intense laser radiation and could pose a risk of eye injury. If necessary, adjust the azimuth rotation or objective tilt of the illumination and imaging borescopes to align the imaged field of view with the illuminated region of the structure interior. If the shearography camera is equipped with an aperture (F-stop or iris), adjust it to the smallest diameter (darkest image) at which the inner surface of the test structure is still clearly imaged throughout the field of view. The small aperture will provide better depth of field. If a Michelson interferometer is used, adjust the tilt of the image shearing mirror to remove all appreciable shear from the image. If the system is equipped with a zoom feature, adjust it such that the desired field of view is imaged. Adjust the focus such that as much of the field of view as possible is in focus. If a region of high curvature is being imaged and focusing is difficult, a higher zoom magnification (smaller field of view) may be required. If a Michelson interferometer is used, adjust the tilt of the image shearing mirror to provide the desired image shearing distance. The greater the image shearing distance, the greater the sensitivity. If data is to be obtained during relaxation after the part is exposed to excitation, apply excitation now. For example, if the test article is to be inspected while cooling from an elevated temperature, apply heat now. With the part at the desired reference state, acquire reference image(s). As appropriate, add or remove excitation. Watch for flaw indications in the fringe pattern displayed on the video monitor as the test article deforms. When the desired fringe pattern is obtained, freeze the image and, if necessary, store it or print it out. Repeat B(1) through B(5), adjusting excitation level or duration, image shearing distance, and the relative position of the test article and shearography head as necessary. Close the laser aperture when testing is completed. Turn off the laser power supply. Power down the image processing hardware. Carefully extract the borescope pair from the structural cavity. When not in use, orient the shearography head and position the tripod to prevent accidental damage to the borescope pair or injury to personnel. The demonstrated feasibility of endoscopic shearography suggests that a similar technique could be used for endoscopic inspections with other NDE methods. Thermography in particular seems a likely candidate method as it is also an imaging technique and is often used for the same type of applications as is shearography. A brief technology assessment was conducted to demonstrate the feasibility of endoscopic thermography. A mirror with a gold front surface was arranged in front of the MSFC Bales Scientific, Inc., Thermal Image Processor (TIP) thermography camera similar to the mirror at the objective tip of a borescope, as shown in figure 7. The distance from the camera to the center of the mirror was approximately 64 cm (25 inches). A test article was placed approximately 140 cm (55 inches) in front of the object mirror and heated with an industrial heat gun. The test article was a laminated coupon fabricated from a 2.5-cm-( 1-inch-) thick aluminum honeycomb core with 4.77-mm (3/16-inch) cells. The honeycomb was faced on both sides with an 8 ply (0°, 90°, ±45°) graphite-epoxy (IM6/3501-6) sheet. The test article contained programmed defects formed by removing areas from the cobond adhesive film that attached the face sheets to the honeycomb core. The specimen was heated from the back side with two 500-W quartz halogen lamps for approximately 5 minutes. Images of the test article were recorded as it cooled due to natural convection at ambient conditions. As shown in the example image of figure 8, the surface temperature profile of the test article was recorded successfully. The three circular indications correspond to programmed defects. This is proof of the concept that a borescope utilizing gold-front-surface mirrors is feasible. However, the test article occupied a very small portion of the field of view. The utilization of relay lenses would remedy this. The relay lenses must be fabricated from materials, such as germanium (Ge), indium antimonide (InSb), or gallium arsenide (GaAs), which allow proper imaging in the infrared wavelength of the camera sensitivity. A borescope using these materials is not currently commercially available, but could be fabricated. Application of endoscopic thermography could utilize either external excitation, via heat lamps or convective heaters such as an industrial heat gun or shop heater, or internal excitation, depending upon the thickness and thermal properties of the structure to be inspected. Internal excitation would require that a heat source be located on the end of the borescope in such a fashion that it did not obscure the imaging field of view. An articulated infrared opaque shield may be necessary to block continuing radiation from the heat source after it has been turned off. Discrimination of flaws in the resulting thermal images would be identical in methodology to conventional NDE thermography. Location and sizing of indicated flaws would require manual registration of borescope orientation and position or could utilize electronic encoders. The feasibility and flaw detection capability of an endoscopic shearography apparatus has been demonstrated. This design utilizes commercially available borescopes for illumination and imaging. Endoscopic shearography allows the inspection of components such as lined fuel tanks which were previously difficult or impossible due to their closed structure. The method allows noncontact nondestructive evaluation without the need for personnel to enter the structure. Modifications of the prototype design which would be necessary or desirable for production and regular use have been suggested. Generalized procedures for endoscopic shearography inspection have been developed. Also, technology assessment has been conducted which suggests a possible design for an endoscopic thermography system. This design would require the fabrication of a custom borescope featuring infrared transmissive relay lenses and gold-front-surface mirrors. Although the infrared borescope will be expensive, its use will be less complicated because it does not require an integrated illumination mechanism. Endoscopic thermography will provide a means of nondestructively confirming endoscopic shearography indications and may have some applications for which endoscopic shearography is unsuitable.